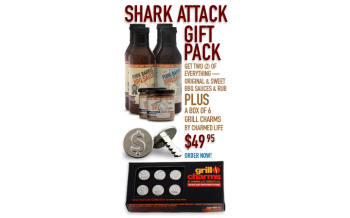 For a truly unique grilling and dining experience there is The Charmed Life Collection Grill Charms™ included in the Shark Attack Gift Pack. This collection of charms has 6 individual and unique designs such as a sailboat, a tropical vacation and other items associated with living a "Charmed Life". Use your individual Grill Charm to personalize your food before you grill to indicate your favorite sauces or flavors, avoid health or allergy issues or any reason you can dream up! Grill Charms™ help you mark or label your pork, chicken, burger, steak, tuna steak, portbella mushroom etc... before, during and after grilling. A new trend with this collection is the "season your own" cook-out. The host provides the meat, the guests pick their Grill Charm™ and choose from a variety of sauces or rubs. Guests season their meat any way they wish and nobody, including the grill master needs to know or care how what’s on it. When dinner is served, guests simply look for their Grill Charm™.